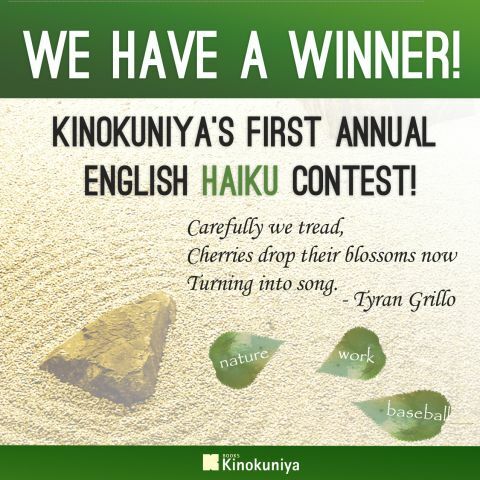 Kinokuniya, a Japanese bookstore in New York City I often frequent, held its first annual English haiku contest, for which I was announced the winner. Those who entered were allowed to submit two poems each on the themes of nature, work, or baseball (a common topic in American haiku). My winning entry is on the theme of spring. I could have quoted you in my cherry blossom post! Congratulations Tyran! Did you compose it in Japanese first? Thank you, Diana! I did indeed compose it in Japanese first and translated accordingly. It was unusual to keep the same syllabic structure, as “true” haiku in English typically abide by aesthetic rather than rhythmic standards.